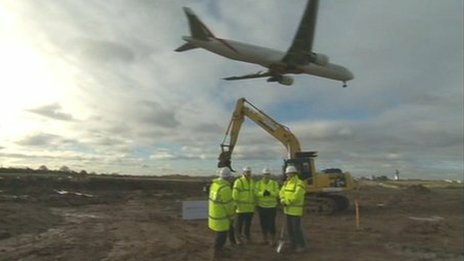 Work has started to extend the runway at Birmingham Airport in a bid to compete for long-haul flights. It could be in use by spring 2014. Planning permission was granted in 2009 and in February final approval was given for the £40m project to extend the runway by 400 metres. Chief executive Paul Kehoe said the extension would allow Birmingham to compete with Manchester for flights to the US and the Far East and double capacity. Birmingham is currently England’s 2nd largest regional airport after Manchester, serving 9.6m passengers a year. David Learmount, from Flight International Magazine, said that although Birmingham could “theoretically” become a “hub” airport and fly to destinations like China, it was “very unlikely to”. He said not enough passengers would fly into Birmingham wanting to go on to those sorts of destinations, unlike Heathrow – and it would benefit largely local “pleasure passengers” who would be able to choose from more holiday destinations. [So not increasing business, and increasing the tourism deficit]. Work has started to extend the runway at Birmingham Airport in a bid to compete for long-haul flights. James Puxty, of the NEC Group whose base is next to the airport, said the runway extension was “really positive news” for the company. However, he said work had to continue to improve the local transport infrastructure to make the airport development beneficial to the region. British Airways and Virgin Airlines have said that even once the airport is able to take on the extra capacity, they will not consider moving any of their long-haul flights from Heathrow. David Learmount, from Flight International Magazine, said that although Birmingham could “theoretically” – with its longer runway – become a “hub” airport and fly to destinations like China, it was “very unlikely to”. He said not enough passengers would fly into Birmingham wanting to go on to those sorts of destinations, unlike Heathrow. Mr Learmount said the greatest benefit would be to local “pleasure passengers” who would be able to choose from more holiday destinations. It has taken more than 20 years of planning but finally work has started on Birmingham’s longer runway. The airport says it is needed because it wants to offer routes further afield, but it can only do that if airlines decide to fly there. Last week both British Airways and Virgin said they had no plans to use Birmingham. So who would want to come? The airport maintains that it is selling the benefits of flying into the West Midlands to airlines all over the world and not just those based here. A connection to high speed rail is planned and if HS2 does get built, the airport would be just 39 minutes from London. That’s faster by rail than to Gatwick and Stansted airports. Airport bosses remain confident that a combination of packed south-east airports and the economic vitality of this region will persuade airlines to come once the runway extension is complete. June 7, 2012 This is yet more publicity for Birmingham airport, to position itself as the solution to the airport capacity problem that is alleged for the south east. There are now roadside billboards in Northamptonshire, Buckinghamshire or Oxfordshire warning motorists of “Heathrow: congestion ahead” and questioning whether or not they are “Going in the right direction?” if heading to a London airport. And the strap-line of this high profile advertising campaign delivers the main message: “Birmingham makes more sense.” Paul Kehoe continues his campaign to boost his airport, saying that after a £200 million investment programme, they could handle an extra 9 million passengers a year. etc Click here to view full story. Birmingham Airport calls for Government backing. Claims 36 million passengers by 2030?